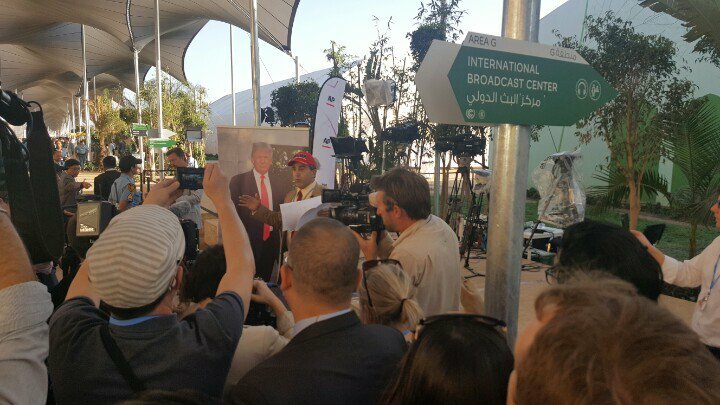 Life size stand up of Trump taken down -- Would UN have objected if life size Obama image were displayed instead? 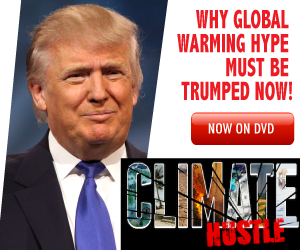 Marc Morano, who publishes the Climate Depot website and co-wrote and hosted the new skeptical film ‘Climate Hustle’, dramatically shredded the UN Paris agreement. The treaty shredding will signify the threat to the UN climate agenda from President Trump. Skeptics cheered the election of Trump and the planned dismantling of the UN Paris Climate Agreement and EPA “climate” regulations to make science and public policy great again. “Today’s shredding of the UN Paris climate agreement will serve as a cathartic moment for the climate campaigners. Instead of continuing to dwell over how they will feel when the U.S. formally rejects the UN treaty under a Trump Administration, we will be offering UN climate activists a chance to visualize the actual document being shredded today at the conference. If nothing else, shredding the UN Paris agreement at the UN climate summit will help delegates move from denial and pass straight through anger and bargaining to the acceptance stage of grief. The UN activists here are in denial over President Elect Trump’s rational climate and energy policies. Shredding the UN agreement is the skeptics way of nurturing the psychological health of climate activists who cannot fathom that the U.S. would kill the treaty. 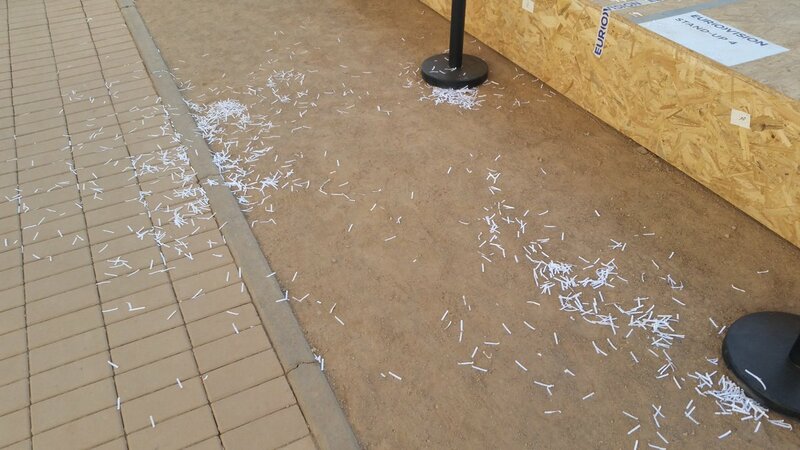 In much the same way an open casket helps grievers accept death, the shredding event serves as a way for climate campaigners to visualize the impending demise of the treaty. The UN climate agreement was not submitted to the U.S. Senate for ratification and empowers UN bureaucrats to have more and more control over U.S. energy and economic decisions for no climate gain — even if you accept the Al Gore/UN view of climate claims. A treaty that imposes central planning and in their own words “global governance” on the world, deserves to be shredded. While people seeking to make a fortune off “climate change” may be upset at the treaty’s demise, this is great news for anybody who cares about genuine abundant energy, ending energy poverty and bringing prosperity to the world. Trump has declared he wants to “Make America Great Again”, and it would be great if America Made Things Again. It is now time to pull the plug and shred the UN climate agenda. Associated Press: Climate skeptic shreds Paris Agreement at UN ‘global warming’ conference – An American climate change skeptic has shredded a copy of the Paris Agreement on global warming at the U.N. climate conference. 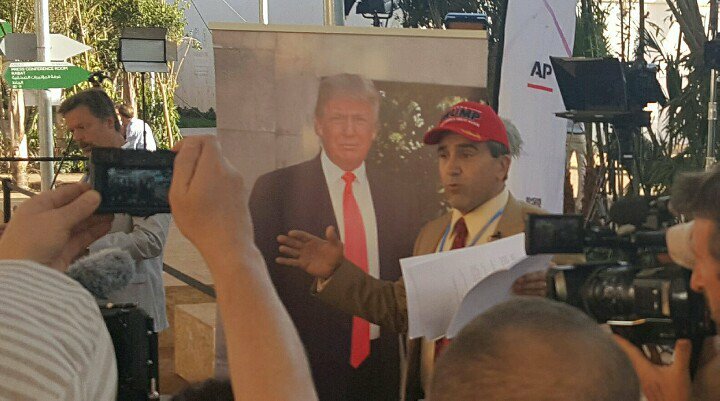 Marc Morano, who runs a climate skeptic website, was led away by security guards after the stunt outside the media center in Marrakech. Morano put the document in a paper shredder and said that’s what will happen to the Paris deal once Trump takes office. Wearing a red Trump hat, he said “the delegates here seem to be in deep denial about President-elect Trump’s policies.” As security guards led him away, he said “we will not be silenced.” Morano is a former aide to Oklahoma Sen. James Inhofe, one of the most vocal climate skeptics in U.S. Congress. 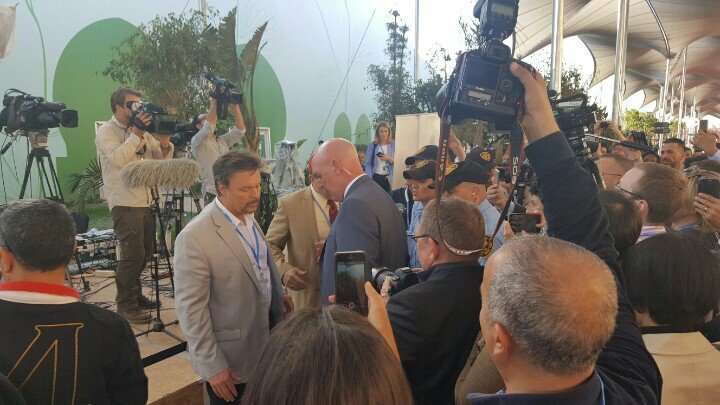 U.N. evicts skeptics for shredding Paris Agreement – E&E News reporter – MARRAKECH, Morocco — Three climate skeptics with credentials from a prominent Washington, D.C., think tank were evicted from the United Nations climate summit here yesterday after they shredded a copy of the Paris Agreement in the middle of the conference venue. – Climate Depot publisher Marc Morano and two other members of the Committee for a Constructive Tomorrow (CFACT), which disputes global warming science, were forcibly removed by U.N. guards after unveiling a life-sized cardboard cutout of President-elect Donald Trump, a copy of the landmark climate deal and a paper shredder. – “Global warming skeptics are rejoicing at Donald Trump being elected president of the United States,” he told passers-by, as his colleagues alone clapped. He noted the president-elect’s promise to remove the United States from the deal joined by 109 countries as soon as he enters the White House. Morano informed participants that shredding the agreement they reached last year in Paris would help “with your stages of grief.” – “We’re going to shred a copy of the U.N. Paris Agreement so that you guys can move from denial, even anger, to acceptance of what should lie ahead with a Trump administration,” he said. 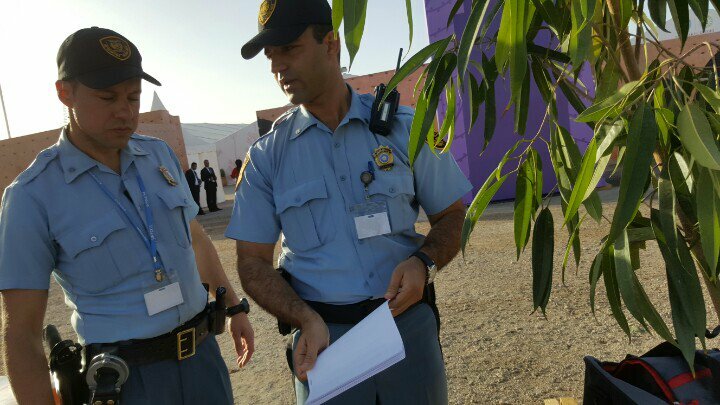 Donning a red “Trump” hat, Morano, a former aide to Sen. Jim Inhofe (R-Okla.), managed to dispose of what looked like two or three pages of the document before being spirited away by U.N. guards. CNN TV covers Morano’s shredding of UN Paris Climate Agreement – Aired in repeated segments on November 17,18,19, & 20 2016: CNN’S ISA SOARES: But while many at the conference are optimistic the president-elect will change his mind, some of his supporters here are hoping he doesn’t budge. Skeptics Thrown Out Of UN Climate Summit: Marc Morano, the publisher of Climate Depot, who was tossed out of the Marrakech summit after shredding a copy of a climate deal signed by nearly 200 countries last year. Morano was taken off the premises and won’t be allowed back in, the U.N. said. 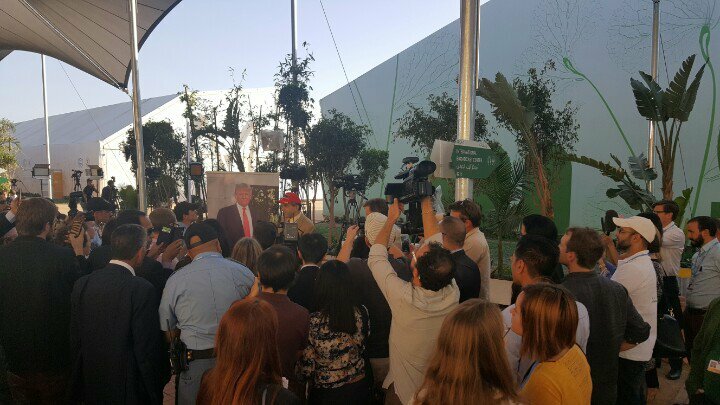 Morano, wearing a red Trump hat, said “the delegates here seem to be in deep denial about President-elect Trump’s policies” before being escorted off the premises by security, according to ABC News. All that remained after the UN and Morrocan security forces hauled off Morano. Shredded paper. Morano has been a staple at these events, staging sometimes elaborate stunts to draw attention to his belief that man-made climate change is not happening. A highlight was 2011, when Lord Christopher Monckton, a British climate skeptic, sky-dived onto the beach in Durban, South Africa, with a banner declaring “Climategate 2.0” — a reference to a controversy around emails stolen from climate scientists ahead of the Copenhagen, Denmark, talks the year before. One year later, Monckton dressed up in traditional Arab attire to enter a summit in Doha, Qatar, and later changed into a suit where he posed as a delegate from Myanmar to claim a microphone and deliver an anti-climate diatribe. The United Nations banned him from its conferences for life after the stunt. This year’s paper shredder incident was tame by comparison, but Morano said the election gave the group something to celebrate. “Global warming skeptics are rejoicing at Donald Trump being elected president of the United States,” he told passers-by, as his colleagues alone clapped. He noted the president-elect’s promise to remove the United States from the deal joined by 109 countries as soon as he enters the White House. “We’re going to shred a copy of the U.N. Paris Agreement so that you guys can move from denial, even anger, to acceptance of what should lie ahead with a Trump administration,” he said. 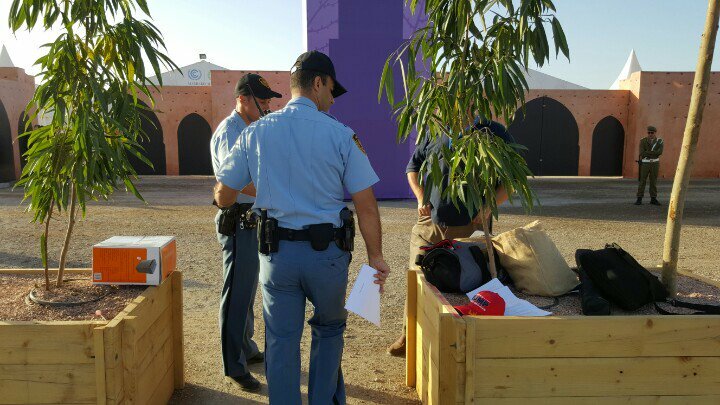 Donning a red “Trump” hat, Morano, a former aide to Sen. Jim Inhofe (R-Okla.), managed to dispose of what looked like two or three pages of the document before being spirited away by U.N. guards.